Before Fred Dryer played the TV detective "Hunter," he was a 12-year NFL veteran and All-American defensive end for Don Coryell at San Diego State. “Hunter” had a detective hunch about Coryell’s Pro Bowl influence on his Chargers and Cardinals players. Dryer believed comparing a star's Pro Bowl trips before and after they played for Coryell would be quite revealing. 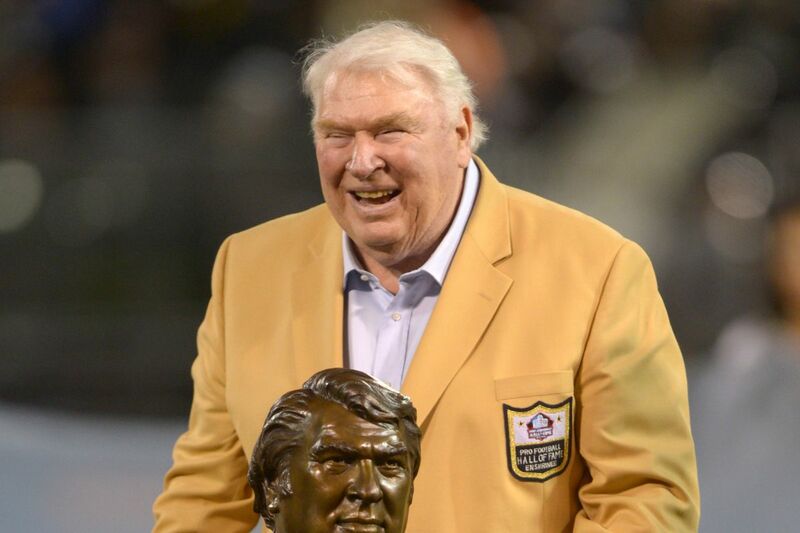 His theory was based on playing in Coryell’s system at San Diego State; he felt it was superior to what he encountered with the New York Giants in 1969 as a first-round draft pick. His thoughts have been echoed by Brian Sipe and Willie Buchanon, two other San Diego State stars for Coryell that found success in the NFL. Seven Cardinals and Chargers never made a Pro Bowl before they played for him. Others added to their previously thin Pro Bowl resume under Coryell. But that's not all. Three of the five Cardinals to make their first Pro bowl under Coryell didn’t earn a return trip after the Cardinals fired him. Four – the Chargers’ Dan Fouts, Charlie Joiner and Kellen Winslow and the Cardinals’ Dan Dierdorf -- were propelled to the Pro Football Hall of Fame. The following is a research focused on Coryell’s offensive players, a reflection of his advanced Air Coryell passing schemes that pushed forward the modern game into the 21st century. It also doesn’t include three Pro Bowl Chargers, Winslow and two offensive linemen, Ed White and Russ Washington. Winslow was drafted by the Chargers under Coryell and essentially played for no other coach before his knee injury. White was an established Pro Bowler with the Minnesota Vikings (1975, 1976 and 1977) before he joined the Chargers in 1978; he made the 1979 Pro Bowl under Coryell. Washington was an established Pro Bowler with the Chargers in 1974, 1975 and 1977 before returning under Coryell in 1978 and 1979. DAN FOUTS (Chargers), 1973-1987, Pro Football Hall of Fame. Pro Bowls before Coryell: none. Pro Bowls with Coryell: (6) 1979, 1980, 1981, 1982, 1983, 1985. CHARLIE JOINER (Chargers), 1969-1986, Pro Football Hall of Fame. Pro Bowls before Coryell: (1), 1976. Pro Bowls with Coryell: (2) 1979, 1980. Pro Bowls with Coryell: (3) 1980, 1981, 1982. Pro Bowls with Coryell: (3) 1979, 1981, 1982. Pro Bowls with Coryell: (3), 1978, 1979, 1980. Pro Bowls after Jefferson was traded in 1981 to the Packers: (1) 1982. Pro Bowls before Coryell: (1), 1979. Pro Bowls with Coryell: (3) 1982, 1983, 1985. 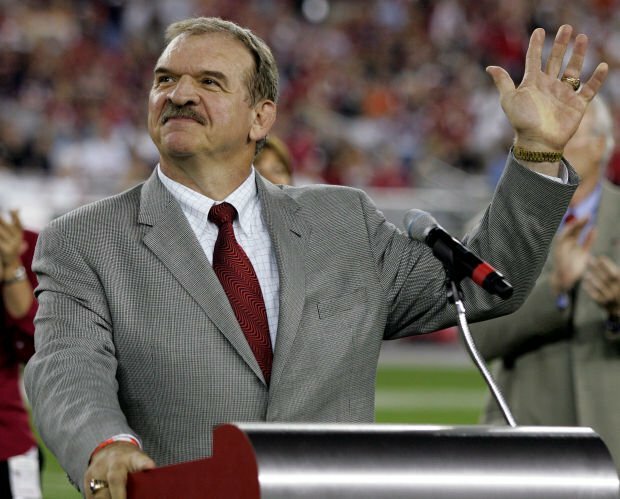 DAN DIERDORF (Cardinals), 1971-1983, Pro Football Hall of Fame. Pro Bowls with Coryell: (4) 1974, 1975, 1976, 1977. 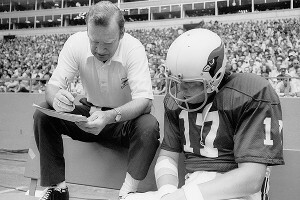 Pro Bowls after Cardinals fired Coryell: (2) 1978, 1980. Pro Bowls after Coryell: none. Pro Bowls with Coryell: (3) 1975, 1976, 1977. Pro Bowls after Coryell: (1) 1978. TERRY METCALF (Cardinals), 1973-1977, 1981. Pro Bowls with Coryell: (3) 1974, 1975, 1977. Pro Bowls with Coryell: (1) 1975. A list of Coryell testimonials could go on and on. Here is a sampling from his Chargers and Cardinals players, San Diego State stars that made it to the NFL and coaches on his staffs. "I met Don at the (college) Coach of the Year clinic in the early 1960s. John McKay won a national title and was speaking on the I-formation. The I-formation was the hot new thing and everybody copies. I was coaching at Hancock College, taking notes. In the middle of John's speech he said, 'The I-formation isn't mine.' He said, 'Don Coryell was an assistant of mine at USC, and he put it in. He is really the father of the I-formation.' He introduced Don. After the thing is over everyone runs up to the podium to get more out of John McKay. I figured, hell, I'm going to talk to the guy that taught the guy the I-formation. I sat with him the rest of the clinic. You think of Air Coryell, but it's not only his record (in college and the NFL) and the passing. There was a time when he was all about I-formation and power and running. If you see two backs in the NFL, that's the I-formation. We all learned a lot from him." “Don is the father of the modern passing game. People talk about the ‘West Coast’ offense, but Don started the ‘West Coast’ decades ago and kept updating it. You look around the NFL now, and so many teams are running a version of the Coryell offense. Coaches have added their own touches, but it’s still Coryell’s offense. He has disciples all over the league. He changed the game."